This section provides a reference guide to the controls and options available when designing the UI for a process created through the Live Processes feature. For basic information about how to access Live Processes, refer to Producing Live Processes. The Forms Modeler's Ribbon presents a set of commands that are relevant to the form as a whole, for example Save, Copy from and Form Properties. It also shows contextual commands, which are related to the current Control selected in the form, such as Editable, Visible and Required. Undo the last action performed in the Form. Save all changes performed in the Form. Copy the given format of a Control to apply it to another. Provide access to the Form properties. Highlight the errors and warnings of the Form as a whole or for individual Controls. Display a list of possible Control types that the selected Control can be changed to. Change the display name of the selected Control. Manage the visibility of the selected Control. Manage the editability of the selected Control. Stipulate if the selected Control is mandatory or optional. Bizagi offers a set of default controls that you can use to create the attributes related to your process. The controls available here have most of the options of the controls delivered by Bizagi Studio. Refer to Form Controls for more information. Presents a drop-down list that displays a set of values. Set the values for this combo using the Data source attribute by clicking the icon. •Bizagi Entities: lets you provide the name of the Bizagi entity to be selected. Bizagi will display all Parameter entities available in the Project (created in Studio). This entity should be a Parameter Entity. For more information refer to Entities for Live Processes. •Create Values: this option lets you create new values. 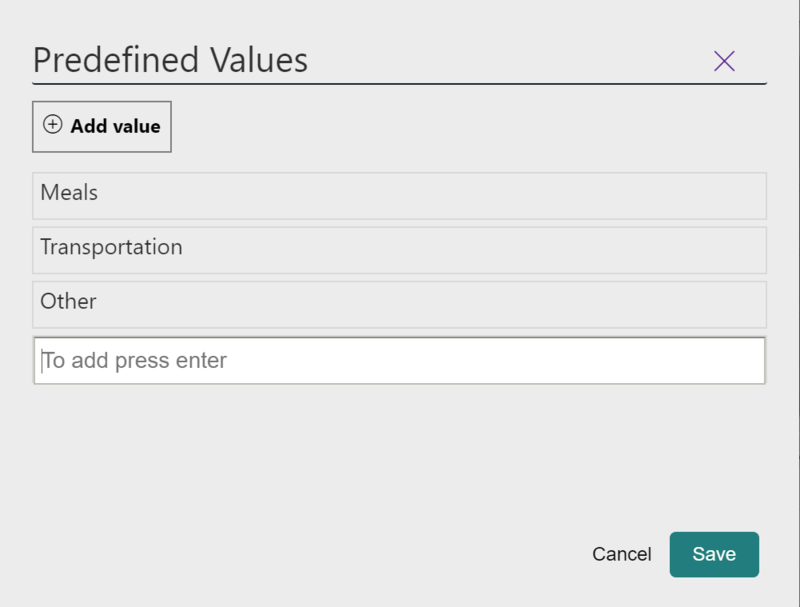 It opens the Predefined Values window where you can add as many values as you need. Click on the Add value button whenever you want to add a value to the list. Shows a calendar. Times can be included if defined. Lets end users upload files. Each File attribute is handled as a collection to associated multiple files with the attribute. Enables the upload and display of images. Searches over all Bizagi Entities created in Studio, and proposes a data entry as the user enters the text. The Bizagi Entity should be defined in the Data source attribute by clicking the icon. Presents a table that relates to a Collection attributes. The table must contain at least one column for display. Presents a user interface where the user can enter text. Displays a Boolean attribute for the end user to select between Yes and No options.